Fleeing from Cambridge, Lydia Vivaldi’s sure her luck has turned — until she learns her one Cape Cod friend is dead. How could a skilled carpenter fall off a ladder at a film shoot? When Lydia lands a soup-chef job at Leo’s Back End, she’s stonewalled by the flirtatious filmmaker and resented by the police. Only Edgar Rowdey, reclusive artist-author of creepy little books, shares Lydia’s doubts about the “accident.” Can this unlikely pair of sleuths — plus a retired football star, a hippie bookstore clerk, a Wampanoag dessert chef, and a pair of Broadway-musical writers — find out what really happened before it happens again? 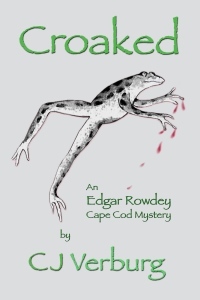 Click here to read a sample of Croaked. Summer on Cape Cod! Lydia Vivaldi just wants to cook at Leo’s Back End and laze at the beach. But with Labor Day looming, she and Wampanoag dessert chef Mudge Miles grab the chance to cater a waterfront lawn party. Inventor Pam Nash just wants to launch Zappa, her new “Taser for pacifists”– until her daughter Ashley, in Las Vegas for a divorce, starts getting death threats. With Ashley flying home for her 21st birthday, Pam taps her old friend Edgar Rowdey to rescue Zappa. But not even they can outwit a murderous stalker. Reluctant though Edgar is to turn sleuth, he has no choice when a dead party-goer turns up floating beside the Nashes’ dock. 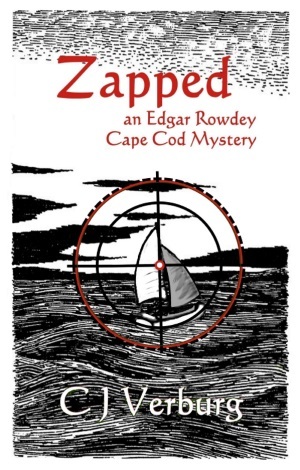 Click here to read a sample of Zapped.